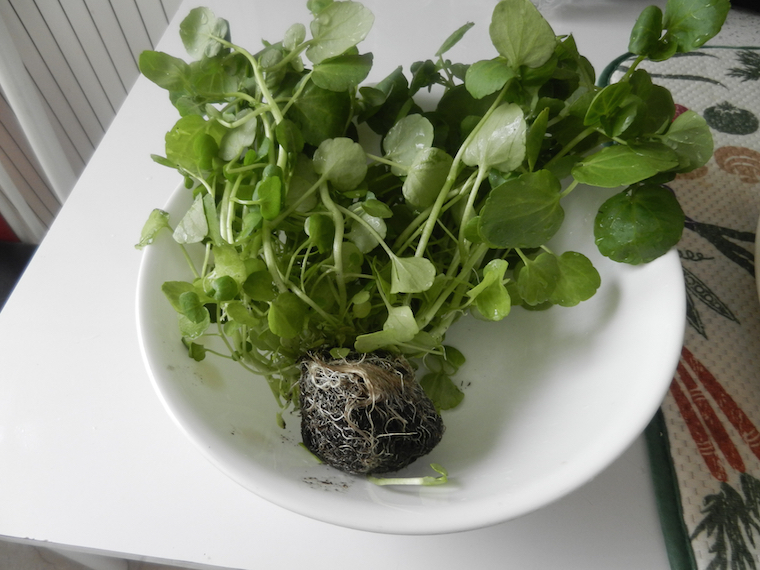 I purchased organic watercress that came with its own roots and refrigerated the whole plant, as directed. People who consumed 85 grams per day of raw watercress had higher amounts of antioxidants and reduced levels of DNA damage, potentially lowering their risk for cancer, according to a study published in February 2007 in the “American Journal of Clinical Nutrition.” Watercress grows in wet areas, and each plant has three to five small, oval-shaped leaves that you can use as you would other types of greens. Compared to spinach and kale, watercress is lower in calories but also lower in most nutrients. However, Bruso continues to write in more detail about the vitamins, minerals, and other nutrients in these three foods. (Click on above link for entire article.) 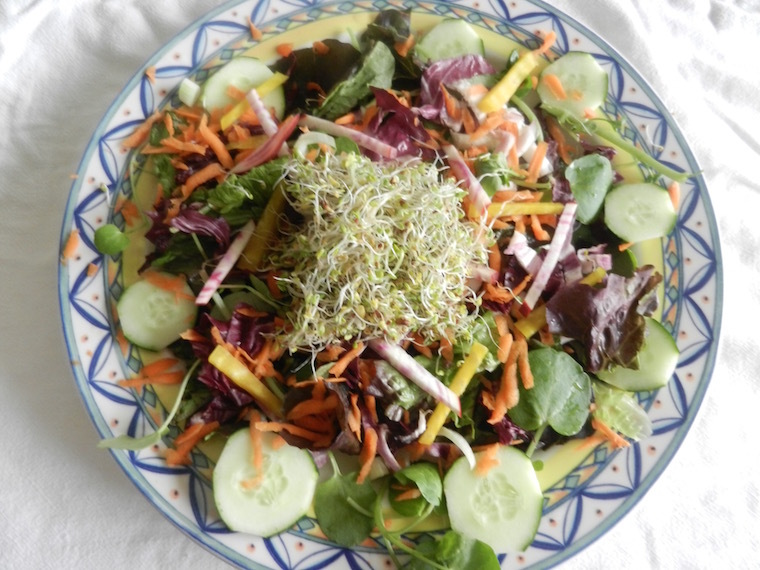 After reading the article, my advice would be to incorporate all three veggies in your salads and cooked dishes, since each one has valuable nutrients in differing amounts. For example, kale has the highest vitamin content of these three greens, but watercress is higher in calcium. 1. Wash and dry lettuce and watercress (or spinach or kale, if using instead or in addition). I use a flour sack towel for absorbency. 2. Tear the leaves of the lettuce into small pieces, chop stems watercress, and roll radicchio leaves into a cigar shape and cut sliver crosswise on the roll. 3. Wash and slice scallions, using mostly the white parts. (Use green tops in soup stock.) Slice cucumber thinly. 5. Toss with herbal-infused olive oil* (about 2 Tbl. ), juice of half a lemon and salt & pepper to taste. *I posted an herbal infused olive oil recipe earlier this month. Here is the link: https://www.menupause.info/archives/18917. 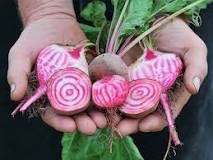 + Here is photo of chiaggia beets. This entry was posted on Wednesday, June 22nd, 2016 at 9:12 am	and is filed under Kitchen Nutrition. You can follow any responses to this entry through the RSS 2.0 feed. You can skip to the end and leave a response. Pinging is currently not allowed. Beautiful salad! I like red lettuce, which I ate last night. Thanks! Looks so appetizing. Your photos are NYTimes quality!! Am trying to ingest more calcium via greens. Isn’t cress on the order of micro greens, which I read are more nutritious than full grown? You are an artist in food. Thanks for the tips! Water cress makes my mouth literally tingle in this hot and humid weather. cooked in tomato and Basil sauce. It was filling an satisfying!